The Complete Standard with Searchable CD-ROM. The official and definitive reference on the technology that is revolutionizing wireless communication. "WAP is at the heart of the convergence of the Internet and wireless telephony-the two most significant technologies for the millennium. "-Chuck Parrish, Chairman of the WAP Forum and Executive Vice President, Unwired Planet. The Wireless Application Protocol is the first common standard to bring Internet content and advanced services to digital cellular phones and other wireless devices by writing a single application. 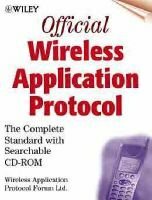 Available for the first time from the Wireless Application Protocol Forum, who developed this breakthrough technology, is the official unabridged WAP standard. An indispensable resource, this book/CD-ROM package gives manufacturers, network operators, content providers, and application developers unparalleled access to the specification in both printed and custom-searchable electronic form. * The complete unabridged WAP standard-fully searchable. Featuring a custom Folio(TM) infobase, this CD affords instant access to all-important WAP features, such as the Wireless Markup Language and Transport Layer Security. As an added benefit, the CD-ROM provides access to a Web site dedicated to providing ongoing updates to the WAP specification, in the same custom-searchable, indexed infobase found on the CD-ROM. * Downloading these files to your hard drive and accessing the protocol revisions will be as easy as point-and-click. The WAP Forum is a non-profit industry association whose members number more than 90 of the top worldwide communications companies. Founded by Ericsson,Motorola, Nokia, and Unwired Planet, the intent is to provide consistent standards to expand wireless information on the same scale as wireless voice.